Registration offers a richly-featured, customizable user profile data storage solution to help you leverage the rich demographic, interests, and friends data shared by your users from their social networks as well as user preferences and other data collected through custom profile fields. It includes a comprehensive site registration system, complete with registration and profile management screens, as well as back-end tools and workflow. It also includes data import capabilities allowing websites to maintain a unified user system for both new and existing users. Registration manages user data remotely (in the cloud) in a customizable, hosted database where it can be accessed, modified, or exported as needed. This centralized storage for both first-party data and third-party data shared via social sign-in provides a unified view of your users and allows access by other systems such as email marketing, content personalization, and ad targeting platforms. Registration lets you augment your user profile data with data append services to help you gain insights to increase user conversion, online engagement, and monetization on your site. 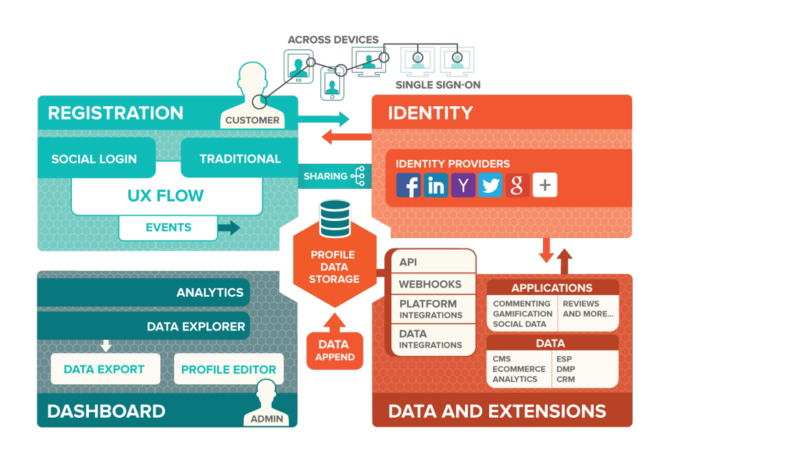 Social - Akamai manages integrations with over 30 Identity Providers worldwide. Akamai's Social Login dashboard allows you to easily configure new providers and add them to your website. Akamai also normalizes the schema of the profile data returned by each provider. Traditional - Akamai acts as the Identity Provider and authenticates users with conventional username and password credentials. Existing accounts can be migrated into the Identity Cloud without requiring users to reset their passwords if the hashing algorithm used in your legacy system is supported by Akamai. Akamai also offers Single Sign-on (SSO) between websites using the same Registration application for both social and traditional login. The diagram below illustrates the registration process for new users. A user clicks the register/login link on a website or mobile app. An Akamai registration/login screen is displayed, allowing users to authenticate either traditionally or socially. 3A: If the user authenticates using a traditional account, the sign-in credentials entered are verified by Akamai. 3B: If the user authenticates socially, Akamai acts as a proxy service and redirects a user to the selected Identity Provider’s (IDP’s) authentication screen. 3C: (not shown) The IDP also presents the user with a permission screen asking if the user’s social profile may be shared. If the user agrees, the IDP will complete the authentication process and return the social profile data to Akamai. Akamai receives the successful authentication response and any social profile data the user chooses to share. The registration form is pre-populated with any matching profile data. The user has the ability to modify this information and must complete any missing required fields in the registration form. Note that if the user authenticates socially, the user is not required to create a password since the user will log in using an IDP. When the user clicks Create Account, a record is created in Akamai's user database. Top-level profile attributes are populated with the data entered in the registration form. This can include the data returned by the IDP. The rest of the social profile data returned by the IDP is stored as a sub-profile in the user’s account. A web-based dashboard offers analytical information across a number of demographic and psychographic categories based on the data stored within a customer’s user database.